Liight is a unique, award winning puzzle solving game from independent developer Studio Walljump where one uses colored lights and shadows to solve puzzles and make music. Each puzzle in Liight is a unique combination of colored lights and targets arranged on a special board. If one completely cover a target with light of the matching color, the target will glow and play music. A puzzle is solved when all the targets are glowing and playing music together. Every puzzle makes a different song each time one plays! Nonstop mode in Liight is a fast paced arcade puzzle game that uses the same basic concepts learned in Solve mode in constant struggle for a high score. With a lot of skill and a little luck, one can keep the game going forever! 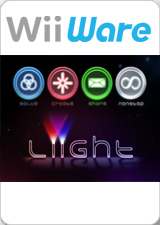 Liight also has a Create mode to make one's own puzzles, and a Share mode to send them to Wii Friends using WiiConnect24! The graph below charts the compatibility with Liight since Dolphin's 2.0 release, listing revisions only where a compatibility change occurred. This page was last edited on 13 January 2018, at 09:35.